This gallery features beautiful girls bedroom ideas. With these playful design ideas you can transform your little girl’s bedroom into the perfect retreat to match her personality and style. With plenty of over the top pink, and frilly princess beds, there are also many other colors and motifs to discover. Whether your girl wants chic, or playful, there are plenty of opportunities for inspiration. 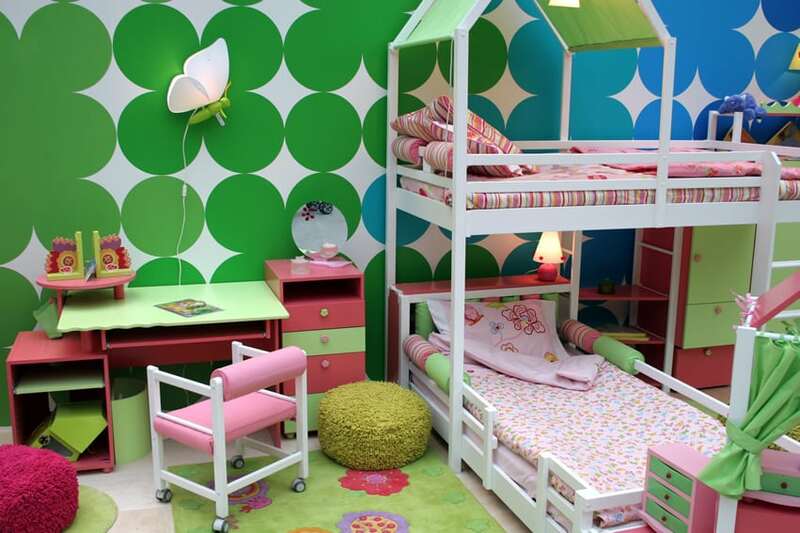 On this page are the top bedroom design ideas for young, and tween girls. In the picture above a sunburst ceiling design provides the frame from which wisps of white mesh edged with dark pink ribbon hang creating a charming canopy over this room’s circular bed. Pinpoint lights along the sunburst rays provide soft illumination throughout the entire room. The soft violet and white palette is accented by sheer curtains with bold floral and heart designs for a playful, airy feel. 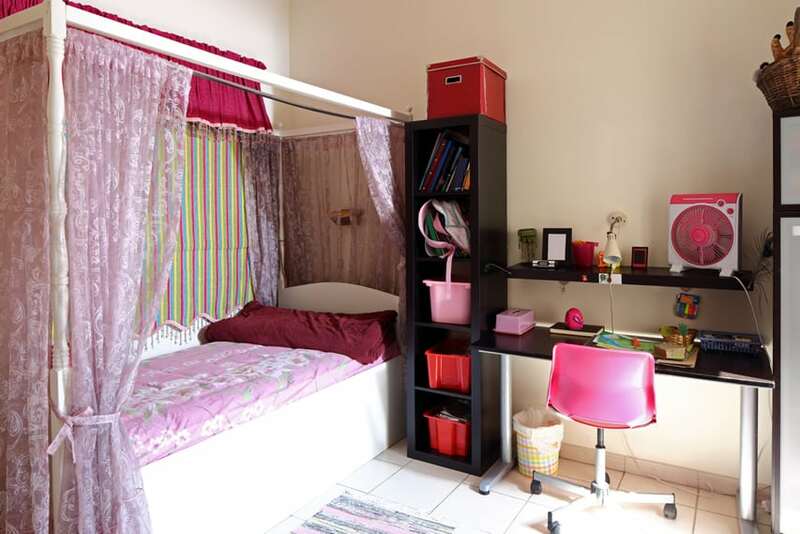 When thinking about a young girl’s bedroom, think beyond pink decor. 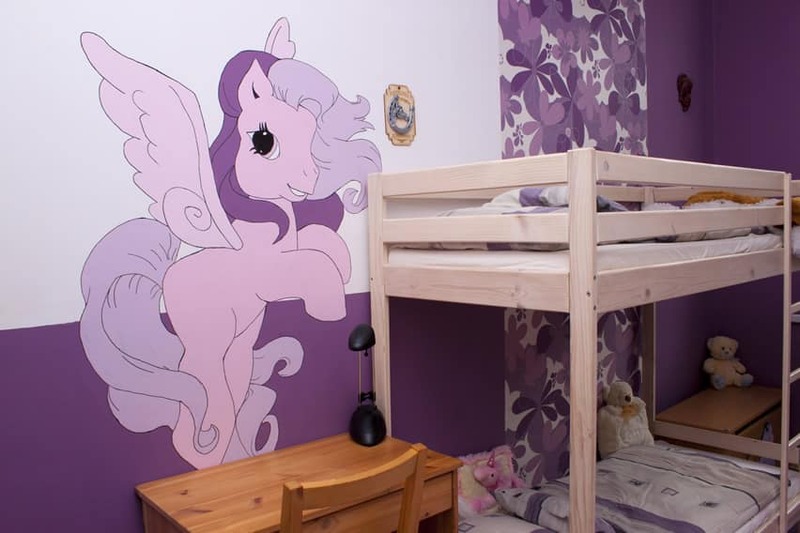 A girl’s bedroom can and should as varied as a girl’s personality. Here are a few idea as to how a girl’s bedroom can help reflect her personal style. 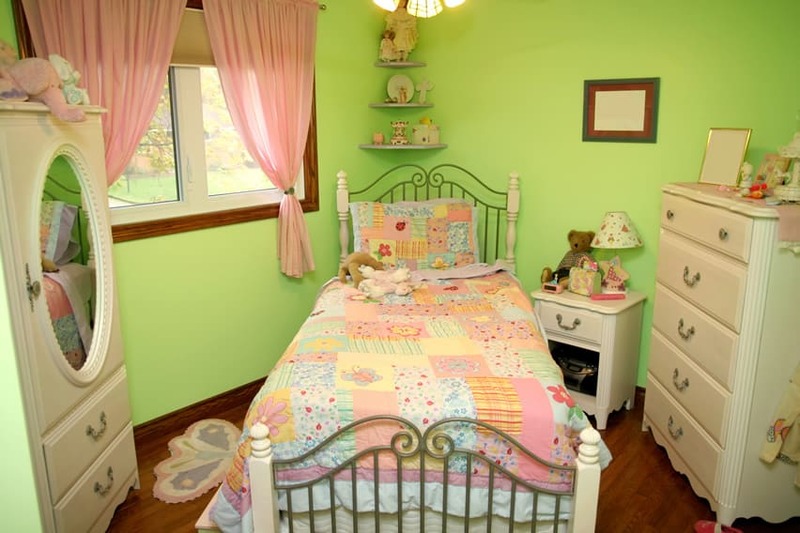 The use of color is an important part of designing a girls bed room. The traditional pink is always a favorite, but you can make a bedroom stand out by using more than pink. Yellow is a nice cheerful color that can lend a sunny atmosphere to a girl’s bedroom. Purple is a color that is associated with royalty and sophistication and can be a nice alternative to pink. Green is a cool color that has association with freshness and life. Blue is not just for boys anymore and has a calming vibe that is great for a bedroom. While pastels and light hues are attractive colors for use in a girls bedroom, think about incorporating dark or neutral colors as well. Dark walls can provide a rich contrast on with lighter color accessories and furniture can really stand out. Dark or neutral color’s can also seem more “grown-up” and add a touch of sophistication to the room’s theme. You can also go with white or light neutrals such as creamy beige or dove grey, to add that sophisticated edge while giving the room and overall feeling of lightness and warmth. White or neutral color walls also allow an element of decorating flexibility. They provide a nice background that can go with almost any accent piece, as a girl grows up she can easily add or subtract certain decorative accents or accessories to reflect her changing style. The focus wall of this room features a charming mural of a tree with spreading branches reaching the ceiling. A bird’s nest nestles safe and secure in the tree branches, a feeling evoked and replicated by the soft green and beige color palette and the warm wood of the bunk bed and room furnishings. The soothing green tones of this room gives it a homey, light feel. Bright candy pink drapes and pastel colored patchwork bedding adds an air of fun while the old fashioned, classical design of the furnishing makes the small space seem cozy. Striking stencil designs in black and pink bring the walls of this room to life. The bold graphic designs and dark framed prints lend a touch of sophistication that will allow the room to grow along with its occupant. The dark pink walls create an intimate feel while the soft beige of the carpets and the freestanding closet and dresser add dimension to the room. The use of pastels gives this room a light and airy feel. The bold stripes of contrasting color running vertically along the walls and accented with flower patterns adds a playful sense of shape. A house shape storage cubby provides a fanciful solution for both the storage and display of treasured items. This room makes the most of a small space, drawing a division between a light and fun sleep space and a school work space. The lacy curtains around the recessed bed with lacy curtains can drawn to create the feeling of a separate smaller room. Wall art in the shape of brightly colored curtains draws the eye to the sleep space and contrasts with the darker, more sophisticated style of the study area. The atypical shape of this room allows for several unique accents such as a long window seat at the far end and the octagonal tray ceiling. Sporting a fun design of polka dots in different colors and shapes, the tray ceiling adds height and depth to the room. The clean dark pink and white trim of the walls and the off-white carpeting give the room a light and airy atmosphere. The white vaulted ceiling with its small tiered chandelier adds dimension and depth to the room. The bright pink walls contrast nicely with the white floor and furnishing. Charming touches such as the bureau painted to resemble a dollhouse and an actual dollhouse create a fun atmosphere accentuated by the pastel quilt and throw rug. This rooms soft yellow walls are soothing to both the eye and spirit. Picture frames placed asymmetrically draw the eye. The green and white, diamond-patterned crown molding and traditional white drawers add a classical charm to the room. The subtle pinks and greens of the bed and duvet set provide a soft and relaxing pop of color. Cheerful flowers and polka dots provide fun accents to the furnishings of this bright pink room. The bureau and wardrobe are painted a shade darker and lighter then the pink walls and sport bold polka dot trim while pretty flower shaped handles serve as fun accents. The bed’s headboard also sports the same polka dots while soft flower shaped cushions serve as low chairs. Whimsical window treatments add a unique touch to this mostly pink and white room. Balloon curtains gently drape over the white trimmed windows, letting soft light in. The soft pink of the room increases the overall airy atmosphere. Old fashioned touches, such as the white wooden bed and desk and the classic wall clock lend an air of sophistication while a charming dolls tea party lends a touch of fun. The focal wall of this room features a fanciful mural of a winged horse, for a touch of whimsy and fun. The room sports a palette featuring mostly shades of violet and purple with a bit of soft pink for a subtly regal feel. The simple lines of the wooden bunk bed, desk and side table lend an air of practical functionality. The two tone accent walls in pink, divided by a bold white vertical stripe add dimension and height to the room. This feeling of height is only increased by the graceful draping lines of the princess canopy over the bed. Using a minimal pallet of soft pinks and dusky violet gives the room a soft and harmonious air to match the simple lines of the furnishing. A mirrored wardrobe gives the illusion of depth. Vault ceilings lend a cozy feel to this mostly purple themed bedroom. Open storage cubbies save space and add dimension as well as provide a display area of treasured belongings. Softly colored rugs in bold prints provide a cheery contrast to the warm wooden floor. The neutral beige walls and light wood floors of this bedroom contrast nicely with the bright, bold colors of the rooms furnishing. Funky, colorful hears decorate the cheery pink bedspread. Cheery mint green throw pillows and a bright pink shaggy rug are welcome spots of color. Open shelf storage provides a space to keep colorful treasures and knick-knacks. A white board and a cork board with cheery colored notes are ready to be used. The vibrant colorings and bold patterning of this room’s accent wall catches the eye and imagination giving the room a modern, youthful vibe. The soothing greens and blues of the walls provide a playful contrast to the pink patterned bedding. The whimsical color scheme extends to the study area with its green and pink desk and drawers. The simple pink walls and the white door, window trim and furnishing give this room a feeling of space. A recessed light runs the length of the ceiling, paired with two ceiling fixtures that cast a soft glow on the entire space. The lively concentric circles of the duvet set draw the eye without clashing with the color scheme. This bedroom sports a bunk bed that doesn’t just provide a space to sleep but also plenty of cleverly hidden storage space in its nooks and crannies. The steps leading up to the second bunk are actually a set of drawers with cubby holes built into the sides. The soft purple and white tones of the room give an all around impression of calm and peace. 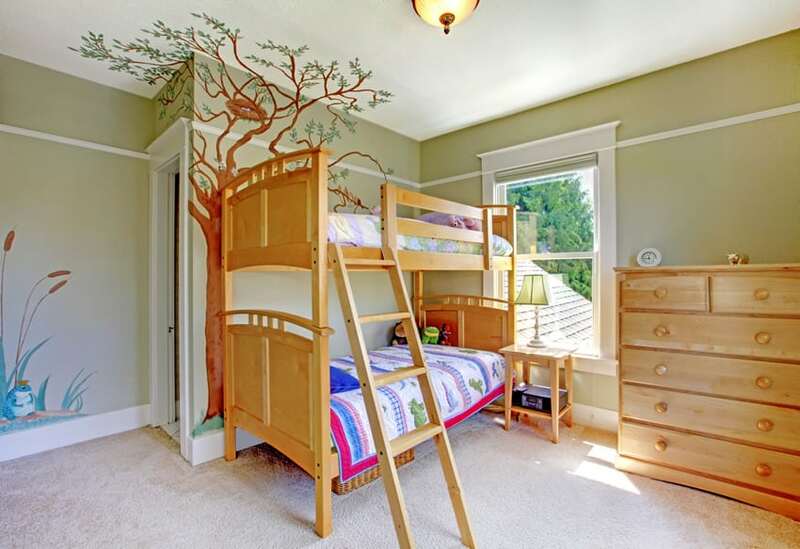 Girls bedroom ideas with bunk beds are popular because they make it a lot of fun for friends to have a sleepover, and have remained popular for many years. The clean white painted vaulted tray ceiling and walls gives a sense of depth to the room. A large picture window along the wall draws the eye and lets in light. The bold pinks of the furnishings contrast nicely with the soft white of the room and help the dark wood of the floor stand out. Fanciful swirls and curls in shades are a bold accent to this room’s simple style. The bright pink wall accents energize the room. The bold color makes the wainscot patterned head board of the bed stand out, while the softer pink sheets striped in cheery yellow create a soothing space to rest. The bed bottom sports cleverly hidden drawers in pink shades arranged in an eye-catching pattern. A bold, irregularly shaped mirror compliments a modern dresser area while a gallery wall with picture frames overlooks a small sitting area. This cozy room is decorated in shades of pink. An eclectic mix of details combine to create a truly unique design for an air of fun. The softly frilled bed spread of the lower bunk matches the sweet cotton candy pink of the curtains. The set of drawers sport uniquely shaped handles – spirals of pink and white – a design element repeated on the railings of the top bunk. The whimsy of a small mural of a unicorn in a field of pink polka dots on the set of drawers is echoed on the shade of the lamp placed on top of it. Whimsical touches, such as soft cotton candy pink lace canopy curtains and a star mobile hanging over the bed, bring this room’s otherwise basic design to life. The neutral beige walls and floor provide the perfect canvas to hang colorful photos and flower shaped mirrored decals. Dolls and stuffed animals along the walls and beside the bed lend an air of fun. A skylight on a vaulted ceiling gives the room a sense of depth and height. The light airy feel is accentuated by the star mobiles hanging from the center of the ceiling. Down on the ground, fun and bold prints are the order of the day, from the bedding, to the rug, to the the patterned wallpaper wrapped around the bottom half of the room. Cubbies and photo’s hanging from the wall provide a whimsical display area while uniquely shaped and stacked small cabinets provide storage space. This sweetly traditional bedroom is soothing to both the eye and the spirit. A cool soft yellow, accented by soft whites and pinks makes up the color scheme giving the room a relaxed, airy feel. Classical white furniture and an intricate chandelier lend a touch of sophistication to the room. Intricate pink floral swirls on the bedding and canopy and a shaggy, off-white rug soften the sparse design and add to the relaxing atmosphere. The blue’s, white’s and beige of this room’s color pallet combine to lend a feeling of cool freshness to the atmosphere. A gauzy white canopy and bright blue bedding jazz up the room’s otherwise simple bed. A blue focal wall provides a pop of color without clashing with the rooms wallpaper. A sweet rug decorated with bold blue flowers enhances the cozy feel of the room. 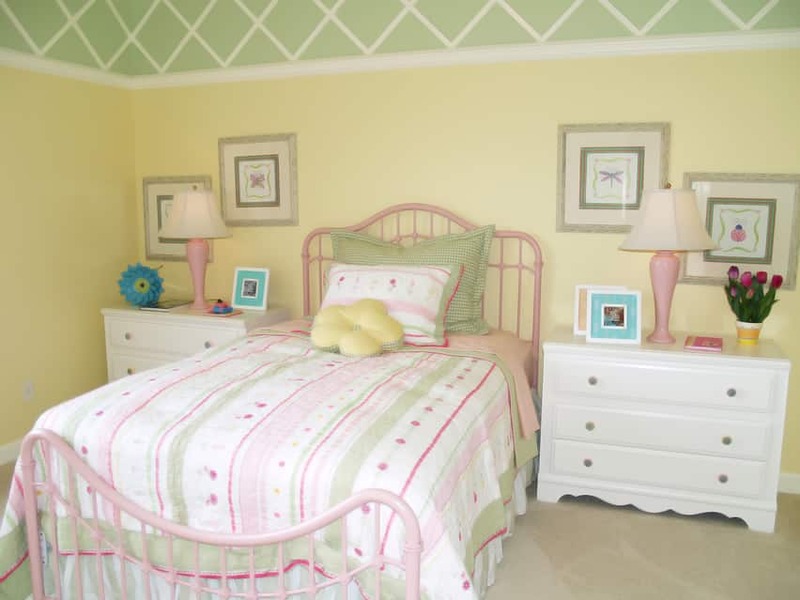 Butterfly decals give this bedroom a unique and fun accent wall. Sheer wall to floor curtains soften the rooms overall appearance while a wall to floor mirror on the opposite end helps lengthen the room. Open, floor to ceiling cubby holes provide both storage and display space. A shallow tray ceiling sports a fanciful mobile. 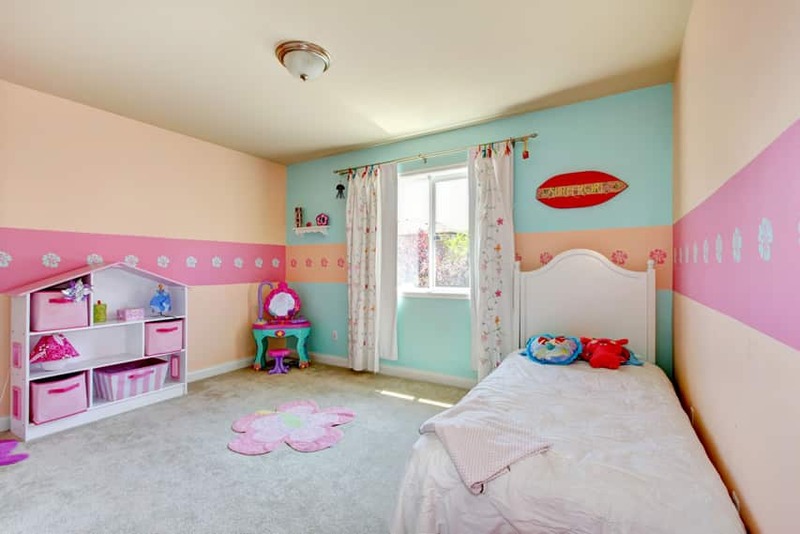 White and pink colors are often used for girls bedroom ideas. This pink and white room provides plenty of color on the bed, booth storage and display space. Surrounded by drawers and cubby holes, a recessed day bed provides a place to relax. A drawer set stacked to resemble rising stairs runs along one wall for even more storage space while the wide drawer tops have ample room in which to display treasured knickknacks. A single box tray ceiling edged with pinpoint lights gives a sense of height.